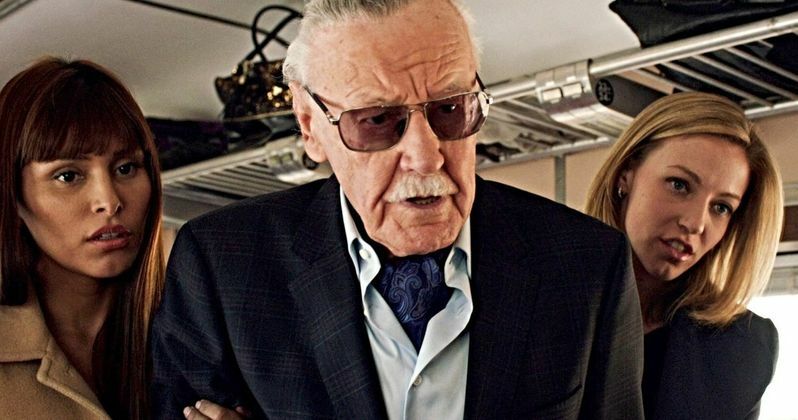 Netflix has a hidden Stan Lee tribute and it's awesome. Lee passed away earlier this week at the age of 95. While his death is certainly sad, it has produced a number of amazing tributes from fans and people who have worked with the comic book legend for years. The original Avengers took out a full page ad to pay tribute to Lee, while several others have made art, posted pictures, and taken time out of their day to thank Stan Lee for all that he helped introduce to the world. Netflix still has Marvel Studios content for the time being, and they've added a pretty cool Stan Lee Easter Egg. When you go to the search function, enter Lee's iconic catchphrase, "Excelsior!" and then hit enter. All of the available Marvel content on the streaming platform will show up. Thor: Ragnarok, Black Panther, Spider-Man 3, Jessica Jones, and much more. It's a simple, yet fitting tribute that Stan Lee fans will more than likely enjoy. Excelsior means "ever upward" in Latin. Stan Lee would often use the word with an exclamation point at the end of it during his cameos or his public appearances. He started using the word in the 1960s when he wrote his monthly column, titled Stan's Soapbox, for Marvel's Bullpen Bulletins. He would end every column with "Excelsior!" and it became his catchphrase. Lee had this to say about the origins of using the word. "I used to have a lot of expressions that I would end my comic book columns with: Hang Loose, Face Front, 'Nuff Said, and I found that the competition was always imitating them and using them. So, I said I'm going to get one expression that they're not going to know what it means, and they won't know how to spell it. And that's where excelsior came from, and they never did take up on it, thank goodness." While looking up Excelsior! on Netflix, you can also check out some of Stan Lee's many cameos in the Marvel Cinematic Universe and beyond. One of his best cameos is in Thor: Ragnarok where he shows up to cut Thor's hair with a pretty evil looking device. While it's not on Netflix right now, Stan Lee's cameo in Ant-Man and the Wasp is another standout, which is pretty hilarious. Now would be a good time to try and track down as many of his cameos on the streaming platform before Disney launches their own in 2019. While Marvel fans are bummed that there won't be many Stan Lee cameos in the future, he already filmed, or voiced a few before he passed away. It was recently revealed that Lee is featured in Wreck-It Ralph 2 as well as Spider-Man: Into the Spider-Verse. Additionally, he'll have live-action cameos in Captain Marvel and Avengers 4, which hit theaters next year. It's unclear as to whether or not Lee filmed a cameo for Spider-Man: Far From Home, but Marvel Studios boss Kevin Feige has hinted at some tricks up the studio's sleeve. Head over to Netflix and search for "Excelsior!"